Activists from Global Justice Bexhill and Hastings have stated their intention to protest on Friday 23 November at 9am outside the offices of Hastings firm, General Dynamics UK on Castleham Road, St Leonards over the role of its parent company in the detention of refugee children in the United States, writes HOT’s Zelly Restorick. A letter has gone from the local group to the CEO/ Managing Director requesting a meeting to discuss their concerns. Following the global uproar against the the Trump administration’s child separation policy this summer, it cancelled the separation policy and undertook efforts at family reunification. However, there are hundreds of children who have still not been reunited with their families, and, in some cases, may never be. It is not just separation. Under the Trump presidency, the number of children held in detention in the US has skyrocketed to its highest ever levels, from 2,400 in 2017 to over 12,000 at present. The administration is also pushing to dramatically increase the amount of time undocumented families can be detained, as well as to speed up the deportation process. The protest is part of a wave of activities targeting the companies profiting from immigration detention in the US, which includes calls for pension funds to divest from these companies. It comes as Donald Trump announces plans to end the ‘birthright’ policy, whereby anyone born in the US automatically qualifies for citizenship, ahead of the US midterm elections. 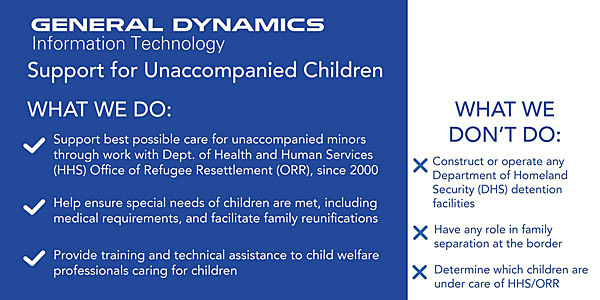 “General Dynamics Information Technology has provided support to unaccompanied minors through its work with the Office of Refugee Resettlement (ORR), a part of the Department of Health and Human Services, since 2000,” writes Amanda Jackson from General Dynamics. “This includes casework support services to help ensure special needs of unaccompanied children are met, including medical requirements, and to facilitate family reunification, only after children are under the care of Health and Human Services. Global Justice Bexhill and Hastings is part of the national Global Justice Now campaign network, which calls for migrants to be treated humanely around the world. General Dynamics UK is a defence company and supplier to the Ministry of Defence. It is part of General Dynamics Corporation, a company which works as part of the immigration detention system in the United States. Hastings Against War info on General Dynamics.